Learn about the temperament and personality of the Sealyham Terrier. Discover what he's like to live with, his traits and characteristics and how he generally behaves. And look at lots of Sealyham Terrier photos. The Sealyham Terrier is the couch potato of the terrier world... he loves to lay around and take naps. He is a clown with a sense of humor, but he is still a true terrier: determined, keen, alert, inquisitive, and spirited. He loves his family and is extremely loyal. He will want to be with you wherever you go, and enjoys snuggling up to you on the sofa. He is friendly, calm, and relaxed, and does wonderfully with respectful children. (Of course, he is a terrier, and will not take any crap from anyone.) He is playful well into his elderly years. He can be quite willful, but he wants to please his owner and once trained, is quite obedient. He has moderate exercise needs and does fine with just a brisk daily walk. He also loves to play ball. He also enjoys earthdog competitions. He is an intelligent dog and needs something to keep his active mind occupied. The Sealyham is fairly quiet, but will bark to announce visitors. He is even-tempered and usually gets along with other dogs. He is adaptable and can live anywhere: apartment, suburban home, or farm. He is a sweet, charming, and devoted companion. 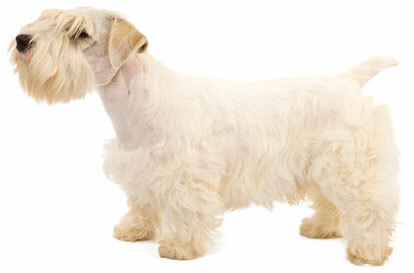 The Sealyham Terrier sheds practically no hair at all. You'll virtually never find a hair in your home!